• Stir salt and sugar into heated milk. Then stir in vinegar. • Turn off the heat and, very slowly, stir until the milk begins to separate into curds and whey. • Leave undisturbed for 10 minutes. • Meanwhile, wet the fine cheesecloth that is large enough to line a colander and hang over the sides. Place the cheesecloth-lined colander over a bowl to catch any whey. • After the milk-vinegar mixture has sat undisturbed for 10 minutes, use a skimmer or slotted spoon to ladle the curds into the cheesecloth. Allow the curds to drain for 10 minutes. 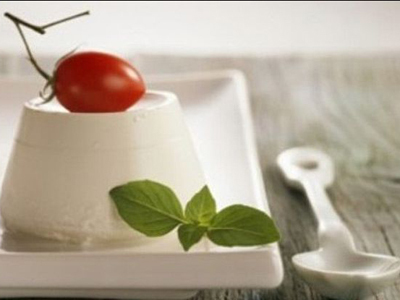 • Gather up the edges of the cheesecloth to form a bundle in order to drain as much whey as possible from the ricotta’s cheese. • Use a length of butcher’s twine to tie the cheesecloth containing the curds into a neat bundle, pressing on the cheesecloth a bit to help the whey drain off. • Tie the string to a wooden spoon or dowel, and hang the cheese curds over a pot or container to collect any remaining whey and continue draining for 30 minutes. • After draining, remove the cheese from the cheesecloth, and transfer it to a nonmetallic bowl or container. • Cover and refrigerate. Use within 5 days. Makes 1 pound of Ricotta Cheese.